DALIAN, CHINA- At first glance, the Everlast Gym in downtown Dalian looks just like any other white collar gym inside a mall. That is, until you look closer at the framed photos on the walls and the man coaching the young clients who hang on his every word and tip. My Chinese friend, Mike, who drove me to the gym, was surprised when I told him about the achievements of the man with the punch-mitts. “I heard he was a good coach, maybe the best boxing coach here. But I did not know he was a legend in your country.” Mike said. We were watching Luisito Espinosa, world champion in two divisions – WBA bantamweight and WBC featherweight. 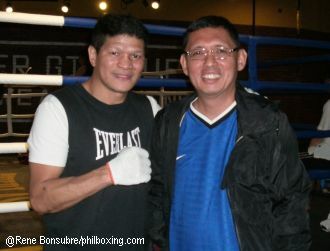 During the 1990’s, he was the face of Philippine boxing. I told Mike a brief history of Luisito’s feats while we looked at the wall photos of the former champ. There were no title belts being displayed which could explain why many here did not know how great he was. Espinosa smiled when he saw me. I told him in an internet chat that I was going to visit him in Dalian. But he didn’t think I was serious. Espinosa was referring to the 2015 decision of the Court of Appeals in the Philippines ordering the family of the late boxing promoter Rodolfo Nazario to pay Espinosa the remaining balance of his prize money for defending his WBC world featherweight title against Carlos Rios of Argentina in 1997 in Koronadal, South Cotabato. We talked about his former manager Hermie Rivera who passed away, the long wait for the court’s decision and his personal troubles that aggravated his plight. I had to ask if he felt his countrymen turned their backs on him. He talked about his separation from his wife and his kids who are in the United States. His financial troubles made him fight past his best years which made him another tragic symbol in the fight game. But even outside the ring, Espinosa showed the heart of a champion. He left the United States and found work in a gym in Hong Kong before relocating to Dalian, a major seaport city in Northeast China. He now earns a good salary and even found a second chance here as far as his personal life is concerned. Despite everything that happened to him, he remains optimistic about the present and future. He smiles when I told him I was such a big fan of his when I was still a student and how I leaped on the couch when he knocked out Alejandro “Cobrita” Gonzalez in 1996. “That is my most memorable fight,” he said. What he did was one of the most difficult things to do in boxing – knocking out an opponent who previously knocked him out, and he did it in the same venue – the Arena Coliseo in Guadalajara, Mexico. In 1993, Gonzalez KO’d Espinosa in two rounds. Going back to Mexico after three years and this time defending his WBC world title and exacting revenge by fourth round knockout was Espinosa’s career defining moment. Espinosa did regret not getting a chance to fight Naseem Hamed. Hamed at that time had the WBO version of the 126lb division title. But Espinosa lost to Cesar Soto in their rematch in 1999 and it was Soto who would lose to Hamed in a unification bout. Espinosa had to go back to work. I told him I was here for a WBO regional fight card on Saturday and his presence would surely be welcome. Top photo: Luisito Espinosa (L) poses with the author. Luisito Espinosa poses with his students in Dalian, China. He said he is very happy here in China. But more than the financial gains, it seemed he was at peace. Even my Chinese friend sensed it, “He is still smiling despite everything that happened to him.” Mike said. For those who are not old enough to remember Luisito Espinosa’s career, he turned pro in 1984 and retired in 2005 with a 47W-13L,26KO’s record. He won the WBA world bantamweight in 1989 by first round knockout against Thai Kaokor Galaxy in Bangkok. He had two title defenses before losing his WBA belt to Venezuelan Israel Contreras by knockout at the Araneta Coliseum in 1991. This sent his career into limbo. But he had a career resurrection in 1995 when he dethroned Mexican Manuel Medina by unanimous decision for the WBC world featherweight title in Tokyo. He would have seven defenses before losing his title in 1999. He retired in 2005. Espinosa is now fifty years old. His career had its up and downs, which gave him the fortitude to survive life outside the ring. Now after four years in Dalian, he is making the most of his second career.